Junior and Maxi cartons only $99.95. RRP $129.95 - Save $30! Midi, Mini and Newborn cartons reduced by $10! See the products featured below or click here to see the range. 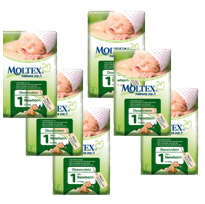 MOLTEX Eco JUNIOR (Size 5) nappies - New carton size - 5 packs for $99.95! (RRP $129.95) Save $30!